The full text of Grain of Truth is available here. 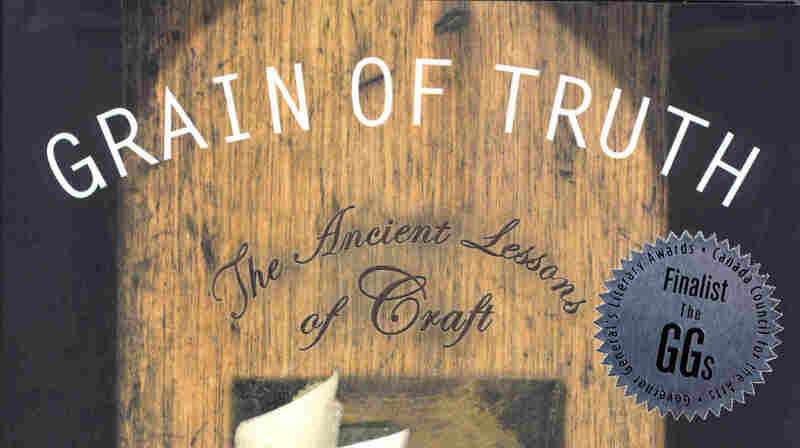 Grain of Truth is a book about the creative process; its flavors and shades and peculiar demands. The narrative follows the meandering track of my creative process through the course of just over a year, as I explore the work of my own hands as a guide in the unfolding of my awareness. Combining ancient Taoist philosophy with reflections on family, culture and nature, Grain of Truth offers a view of the diverse rewards of creative endeavor — which can be both nurturing and relentless. Grain of Truth, shortlisted for the Governor General’s award (the highest literary award in Canada), is an exploration of creative work as devotion, as revelation, as a rough opening polished by the shapes of beauty. Through the experience of rebuilding a childhood sailing dinghy, crafting a garden lantern, making a musical instrument, or simply stacking lumber, I search for the essence of creativity. I show how the work of hands can fill each moment with new breath, new forms, so that the self becomes gossamer-light, a kite held aloft by unfathomable strings. This simple alchemy begins in the hand as it opens the palm and reaches, with supple fingers, outward. Give yourself an evening in a quiet place and read this little book with attention. It could change your life… Laird writes about wood with the voice of a poet and the eye of an artist…his sentences are spare, transparent, unobtrusive vehicles of meaning. With his prose he achieves a rare melding of form with content. Ross Laird’s first book is a rich amalgam of personal reflections, practical philosophy and lyrical description…What gives this book its depth is its fine integration of the personal and the universal…Grain of Truth is a polished, finished artifact. Careful, congenial, Zen-inflected rustications on woodworking, and, by extension, an entire worldview…Laird has an admirable ability to focus closely, whether it be on the precise, demanding work of sharpening a knife on a water stone (then brooding on how the perfect edge is invisible, absent of light) or getting lost in the architecture of a woodpile, letting it incubate ideas on future cabinetwork. There’s a lively meditation, as he builds a wooden block plane, on the keen sensibility of one’s hands, and there’s a deconstruction of an old rowboat that turns into an archaeological dig through memory. Laird is ever-attentive to the moment of creative impulse…an elegant, calming pleasure to read. Laird, a poet and Vancouver native, reflects on the rewards and frustrations of woodworking in eight pensive chapters ingrained with sensual, sinuous language and an intuitive understanding of the topic’s metaphoric possibilities…Laird artfully conveys his appreciation for natural beauty and spontaneity, his reverence for hardwoods, tools and woodworking methods and his espousal of the Taoist principals that have sustained and nurtured his creative life. Indeed, his burnished prose style counterbalances what otherwise would have been an austere memoir of one man’s discipline, dedication to craft and Rilke-like embrace of solitude through work…This meditative book provides an inspiring glimpse into the creative process. Exquisite, poetic writing on the subject of craft is a rarity. Laird is every bit the craftsman – as much of words as of the wooden objects he creates. A marimba for his children, a garden lamp, and the other projects he writes about are only the starting points on the internal journey of creativity his readers are invited to glimpse. He is meticulous in describing even so basic a process as making a wooden plane, and in his hands, the outward procedures involving angles and alignment become connected to an inner search for clarity of purpose. Readers will also appreciate the organization of the chapters into ancient symbols of Taoist life energies: probing Wind, Deep Water, Shallows, and the Unfathomable. The relationship between the materials of the earth and the process of transforming them to conform to the need or desire of an artist has never been delineated so eloquently. Enthralling reading for the creativity shelf. I stand in the great hall of the Museum of Anthropology in Vancouver, head bent back, gazing up forty feet to where precise images have been carved into cedar totem poles by craftsmen whose art has been almost entirely erased by time. This museum possesses one of the finest collections of carved wood artifacts in the world, and I feel quite at home here. Near the bottom of a nearby pole, a smooth-shouldered wolf rests in the shadow of a killer whale. The eye of the whale is a shadowed well. This wood, these bones, trace the nature and purpose of a vast awareness, a living spirit in the grain, each knot and every growth ring a secret hieroglyph worked carefully into many layers of meaning. The echo of leaves is here, the resonance of damp fields half submerged in twilight, of dark soil and tales of night. And long, interwoven strands of time knitted together by wood and human hands. The wood has been coaxed into shape — whittled, chiseled, sculpted with broad, incising strokes — by tools of utmost antiquity, by weapons, by stones, by meteors, by fragments of ships: countless forms oiled by luminous skin. Although the focus of the collections is northwestern — hundreds of examples — I also find works from Indonesia and Greenland and China, specimens of all kinds and of diverse ages: an eagle with a five-foot, intricately carved beak, a tenebrous skull shape, moons and ravens and wild spirits of the forest. There are objects of great power here, and I am daunted by the virtuosity of craftsmanship displayed in so many of them. Working toward this level of refinement in carving will take me to the edge of my skill. But the spirit of creative work calls to whomever will listen, and as I gaze at these ethereal faces staring back from a lost age, their muted colors hiding a secret flame, once again I hear that whisper spiraling out from the primordial source of things. In the instant I reach my hand to the wood and sense a silent energy thrumming inside, I become aware that many things will intrude to push and prod me out of this elemental state — mishaps and details and a pervasive lack of courage to do my absolutely best work — but an equal number will draw me back to the lucent and creative source. The stillness of that source lies behind the dream of an ancient, verdant grove that wakes me in the night, momentarily; it is the reason for my sudden pause, as I put the key in the lock, my knowledge that something fleetingly caught my eye — a shape I almost recognize — before stumbling into the house. Birds before morning and sand buried deep in the cold desert will together speak, reminding me that despite my umbrage and anticipation and indifference, behind my uncertain footfalls in the night’s shadow, quiet, undeniable hands usher me onward. … Dark sky, cold rain, and a ground made bright by the sinuous shapes of wood sawn fresh from the tree: ivory of birch, faded porcelain of maple, linen of alder. There is some cypress, too, its scent of lemons reaching up from the wet soil to sting me with exhilaration. A black, rough flitch of walnut rests alongside the opened bole of a Douglas fir, its orange grain glowing from a sunrise heart. A woodpecker knocks once on the trunk of a cedar, then falls silent. I reach down to touch the alder, and in the moment of reaching, of touching the silent wood with its living core of mystery, it becomes clear what I must next do. As I cover the stack, my thoughts turning to the work ahead, I acknowledge that the wood’s redemption — its escape from dissolution — is also my own. We are bound now, fragments of becoming. We share the journey of the totem; the faces of the figures are hidden in my hand. In my own hands I study the small whittling scars, the insignia left by a mishap with bleached coral, the numb place where I almost sliced off my finger cutting firewood in the rain. I wonder what indelible traces will be left by this next endeavor — teeth marks from carved mouths. I reach toward a horizon of prophecy, to mentors and unknown guides, to an unbroken cord of lineage secured at the source by invisible hands.